Many of my writings will deal with making “Peace on earth, goodwill to men,” a reality. Mankind has looked forward to an age of peace since the beginning of this cycle of civilization. Most of us believe in our hearts that such a thing is possible, yet there are many threatening possibilities that loom on the horizon that cause fear and doubt in the souls of men and women. Can these obstacles be overcome to bring in the age of peace? That is the question. Is it going to take some great divine intervention to create a new age of peace or are we expected to do it on our own (with guidance from above)? What are some steps individuals and groups can take to help bring peace and stability into reality? Is the coming age of peace a sure thing or is it possible that it could pass us by if we do not do our part? I enjoyed all your postings on world and individual peace. Unfortunately, I do not have time to do them justice with my comments, but even so I’m sure each of your postings had meaning and aid to someone else on the list. If we put these two ideas together we arrive at a good plan. Live up to the highest we know and then do all within our power to change the world for good. Then when we have done all we can on our own higher powers will step in and help. Answer: We pretty much answered that with the last statement. It seems that most agree that there will be divine help, but it will likely materialize through us individuals taking responsibility. Someone accurately mentioned that God will not do something for our good that takes away the power of free will. When everything is said and done there is a strong likelihood that this will be the prevailing hindsight. Most seem to be of the opinion, as I am, that an age of peace (at least for all) is not a sure thing, but we all have to do our part. The only time a future event will be a sure thing is when a great life that has power to create the event has made a decision in that direction. There are also certain cycles that if known can predict a future event (like spring following winter), but these are effects of laws set in motion eons ago. The guiding lives of humanity desire an age of peace and prosperity for us, and are guiding us in that direction, but we have full power to decide to go in a direction that would prevent its materialization. That great entity which occupies planet earth, however, deserves a rest that peace will bring and this planet will have its rest whether or not mankind goes along with it. If we do not cooperate, great destruction will occur and God will “destroy them which destroy the earth,” (Rev 11:18) as was written by John. If we do cooperate in the plan for peace and goodwill that will allow a rest for the planet then we can move into the predicted great age quite gently. It is up to us. This is the only question that I feel was not covered on all the bases. The theme “let peace begin with me” seemed to be a common and correct thread with the group. If it were true that everyone on the earth was peaceful and refused to use aggression to promote his belief system then we would have an abiding peace on earth, but unfortunately such is not the case. 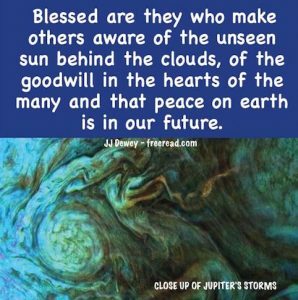 There are also many peaceful people who are under the authority of the Beast and will blindly follow orders of some authority that takes them away from peace. Let us take the Nazis during World War II. On an individual basis most of the soldiers were nice peaceable people, but they were under orders and if they did not cooperate they would suffer dire consequences. This type of situation in greater and lesser degrees forces many peaceable people in aggressive directions. To bring out the best from the general goodness that permeates all the people of the various nations, the whole of individual nations and the planet must be influenced in the ways of peace. Another problem is that many peoples are conditioned by their national media, religion and traditions to hate certain people of other nations. This negative illusion of these otherwise peaceable people must be broken down as well as the changes needed in the governments themselves. Nevertheless, if the people themselves learn to love and accept people of neighboring nations it will only be a matter of time before the governments follow suite and war no longer becomes an option. The question to consider today is what can a nation and its people do to befriend the people of a potentially dangerous nation such as Russia or China? How can we make friends with the people themselves and eventually generate a feeling among the general populace that war with us should not happen because we are friends? Is the Internet likely to play an important role? How? As to the question asked in the 2nd to the last para — I believe that one of the greatest “problems” are policies of appeasement.